Qb Equalizer digitally recreates legendary API 550b Vintage American Console equalizer*. This equalizer allows you to chisel your signals with surgical precision. It has a modern, easy-to-use user interface. You’ll love its aggressive structure and proportional Q feature. The VERSION 1.1.1 features an improved better user interface that is easier on your eyes. This equalizer will keep you running tirelessly even after hours of hard work. You will not be able to help yourself from falling in love with it! The QB Equalizer is fast, intuitive and highly responsive.It will unleash your inner mad scientist with the QB plug-in and add a special note to your music. * API is a trademark of Automated Process,Inc. 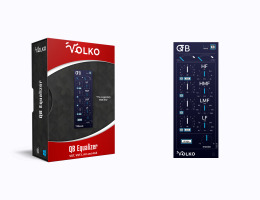 the originator of the 550a, 550b, 560 and is not affiliated with Volko Audio LLC. Seven selectable center frequencies: 30Hz, 40Hz, 50Hz, 100Hz, 200Hz, 300Hz and 400Hz. Seven selectable center frequencies: 75Hz, 150Hz, 180Hz, 240Hz, 500Hz, 700Hz and 1kHz. Seven selectable center frequencies: 800Hz, 1.5kHz, 3kHz, 5kHz, 8kHz, 10kHz and 12.5kHz. Selectable filter type: Shelving or Peaking. Seven selectable center frequencies: 2.5kHz, 5kHz, 7kHz, 10kHz, 12.5kHz, 15kHz and 20kHz. The amount of boost or attenuation is continuously variable from -12 dB to 12 dB. Proportional Q narrows filter bandwidth. Proprietary topology which is optimized for low latency, low noise and high dynamic range. Built-in reference-quality upsampling algorithm which can be enabled at sampling frequencies 44.1 kHz and 48 kHz to achieve bell shape symmetry at high frequencies. Supports sampling frequencies up to 384 kHz.